Two for the price of one! 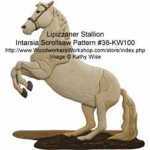 The designer of this scrollsaw project has included two different versions of this Lipizzaner pattern. With and without the rider. The finished project measures 16 inches wide and 17 inches tall, and has either 86 or 151 pieces. 3-D LIFE SIZE 7ft tall Horse Woodworking Plan. A young equestrian rider balances and guides their horse over the obstacle. Full size drawings. Custom sizing available.